Last time we took a look at the Retro Gen adapter by Retrobit, a Genesis clone built into a Super NES Game Pak. This week we look at the Game Boy Advance version of this clone in a cartridge. Is it as good as the Genesis one? PROS: You can play GBA games on your TV! CONS: Not without some inconvenience. REPLACEMENT: For your GBA? In some instances yes. 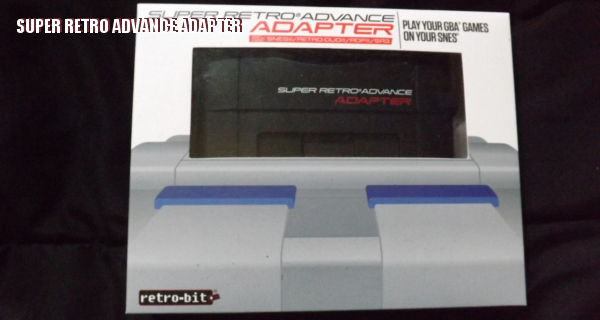 The Super Retro Advance, like the Retro Gen is a clone system in a cartridge. This time around Retrobit made a GBA clone. It has the one major issue the Retro Gen has, and that is it requires its own AV cables. It uses the same one set the Retro Gen includes. So if you own both, you can leave the same cable plugged into the TV. Then plug it into the either cartridge as you need to. Otherwise if you’re out of ports on the TV or your switch box, you’ll have to hot swap the cables with the Super NES cables. Other than that inconvenience, it’s a pretty cool system. Once again, the system uses the Super NES as a power source. The game performance is pretty good here. Colors are bright, and things look pretty crisp. In most games. The thing to remember is that these games were designed to run at the Game Boy Advance’s screen resolution of 240 x 160. Playing on your TV is going to stretch that out a bit. The system displays the games at the proper aspect ratio, but it doesn’t re-render the games at a higher resolution. Now before you balk, note that you’ll see a similar thing happens when you buy GBA games on your Wii U. It doesn’t look terrible, but you’re going to notice the pixels a bit more since they’re being up scaled rather than completely re rendered. If you can’t get past that, then you’ll want to stick to an actual GBA, GBA SP, or DS. The other option is the Game Boy Player for the Gamecube, but finding one with a working disc these days can be difficult at times. If you do, they’re often fairly expensive. When factoring that all in, the Super Retro Advance becomes an attractive option for those who want to play their GBA collection on a TV set legitimately. 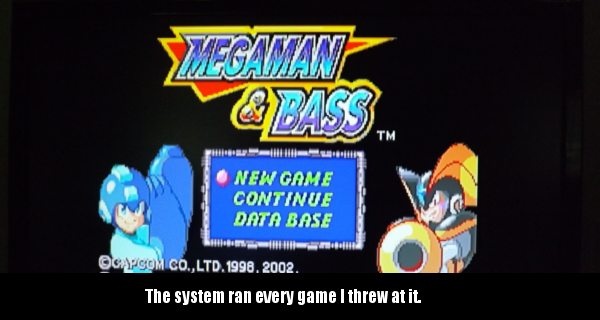 I threw several games at mine, and they all ran perfectly fine. Performance was pretty good here. I didn’t run into any unexpected slowdown, and nothing crashed. The games stayed in the system nice, and snuggly. Sound was almost identical to what I experienced on the Game Boy Advance. 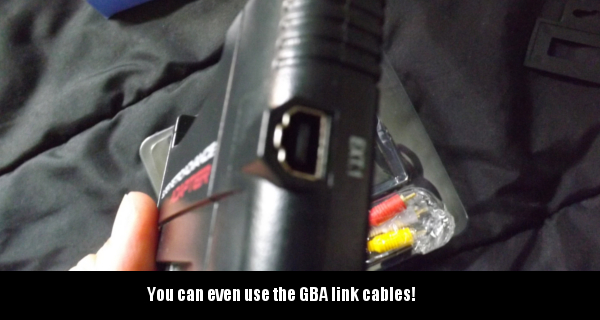 The system also has a GBA link cable port on it. So if you want to run games that support multiple GBA multiplayer you can do so. If you ever ended up passing on some portable games in the past because you had problems looking at the small screen you might like this. 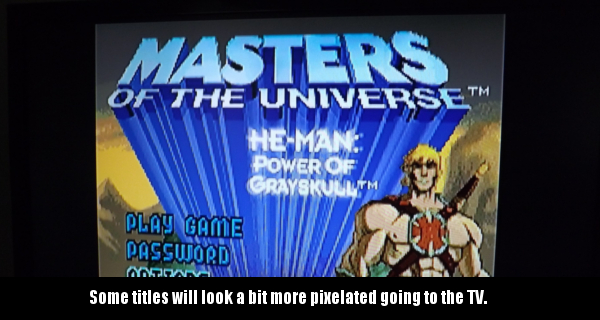 It opens up an entire library of games for you to check out using your Super NES for power. The GBA library is indeed stuffed with many children’s games, and it has its share of shovelware. But, it also has a multitude of wonderful Nintendo games, and a lot of great games that rarely showed up in other places. Stuff like Ninja Five-O, and Iridion II. So if you haven’t played them because you never got into the handhelds, this might be something you want to look into. In the end it’s a short review this time, but it’s worth checking out the Super Retro Advance. It isn’t going to do it for the purists out there. Sadly, if you just have to have the 1:1 experience on your TV you’ll need to invest in a Game Boy Player with a working disc. But for the rest of us, this is a great option even if you do have a cable swap. If you’ve decided to get yourself a new 3DS, but you want to keep on playing your GBA games, the Super Retro Advance might be your ticket. Remember a time when Konami was lauded? Throughout the 80’s, and 90’s the company put out not only heavy hitters, but some lesser known gems as well. This wasn’t only true of the console end of things. Handhelds saw some really great efforts from the company over the years. Including this game. 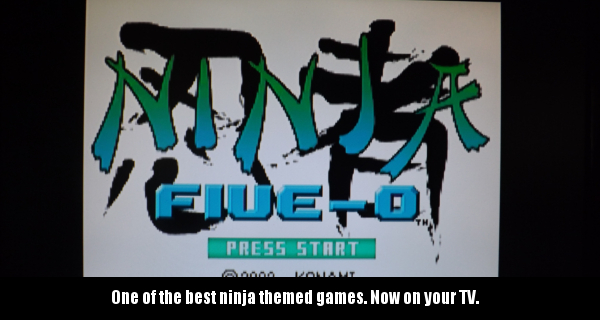 Ninja Five-O will wow you with its combination of two of your favorite things. It’s the peanut butter, and jelly of action games. PROS: Crisp graphics. Smooth game play. CONS: High difficulty. Light on story. RIBBIT: One of the bosses rides a giant frog like a horse. Ninja Five-O doesn’t have a particularly deep story. You play a Ninja, who is also a police detective. (The European version was actually titled Ninja Cop. )You end up having to travel all over the world to sneak in, free hostages, and defeat terrorists. 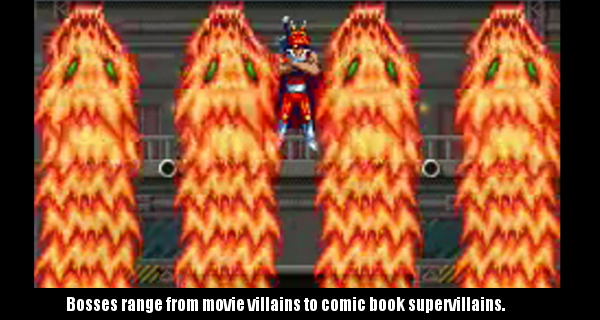 Basically, the campaign’s story is a combination of Die-Hard, and American Ninja 2. It will lead you through a bank heist, a warehouse, an airport, an airplane, caverns, and a military installation. Each of them filled with a plethora of traps, obstacles, and criminals. There isn’t much in the way of character development, or plot here. 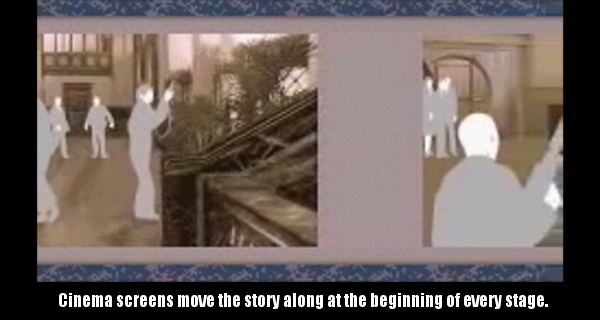 The most you’ll see is some text narration, and cinema screens before each stage. These don’t give you the movie feeling that the NES Ninja Gaiden games do. The game barely tells you any of the names. Generally they give you a brief overview of your objective in the area, and little else. But much like the aforementioned movies, the audience is going to come away entertained by the action even if the narrative is lacking. As for the actual game, the combination of the aforementioned movies seems fair. Because the game play marries Shinobi’s platforming, and hostage rescuing, with Bionic Commando’s grappling, and Metal Gear’s stealth. The end result is nothing short of spectacular. Each stage is broken up into three sections, before a boss encounter. The object of each of the stages is two-fold. First, you have to get a red key to unlock the stage exit door. In order to get the red key, you’ll have to find a few other keys because you’ll need to enter other rooms, defeat particular enemies, or break open a certain crate to find them. Each key is color coded, and corresponds with a different door. But finding the keys isn’t enough. 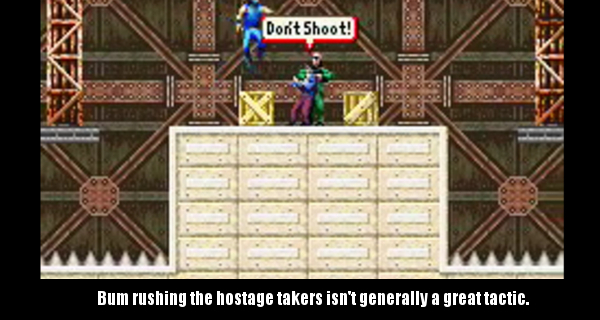 Because the second goal is to rescue as many hostages as possible. Freeing the hostages isn’t an easy task. Most of them are being held by enemies who will use them as human shields if you try to attack them. This leads into an awful lot of stealth game play. 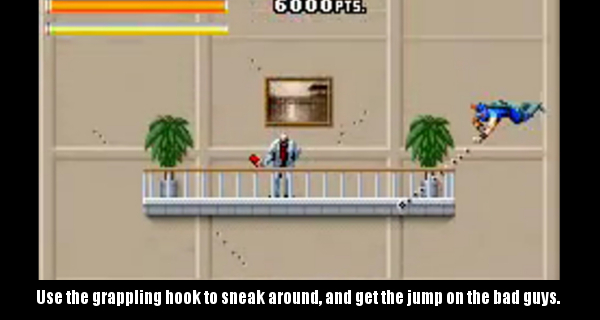 Thankfully that stealth game play is very satisfying. The game makes very good use of its grappling hook mechanics. You can grapple onto most walls, and surfaces. There are also giant rivets in backgrounds you can grab onto. Once you’ve grappled onto a surface, you can swing back, forth, even in circles. Admittedly, this can be hard to get the hang of when you first start playing. Once you’ve gotten the basics down, you can even swing from surface to surface! This allows you to get the drop on a lot of the terrorists, attack them from behind, and free the hostages. You also have a number of attacks. The first is your sword. You can swing it at enemies, swing it while jumping to do a somersault attack, and break open crates. The second is the ability to throw a shuriken. These can be handy for bad guys that take a few hits to die, or for freeing a hostage from afar. The shuriken can be powered up too. Throughout levels are little lightning bolt icons that can be picked up. Each one you pick up upgrades you one level. You can pick up to three. With the power ups, you can toss lasers, and fireballs. You’ll need these to beat most of the game’s bosses. Getting hit after picking up a lighting bolt causes you to lose one, and downgrades you back a level. This makes the game even more challenging. Because not having these power ups puts you at a bigger disadvantage. However one attack you have at your disposal is the proverbial smart bomb. If you fill a meter by knocking off enemies, you can fire off a screen wide animation that takes out every enemy on the screen. You’ll want to use this a lot in situations where freeing a hostage seems impossible. Be it because there are too many enemies, or because of hazards. You get a slide move to help you through some of these, but that only helps so much. There are exposed electrical wires, torches, spiked pits, spiked walls, and more to deal with. Sometimes the game hides a hostage, power up, or key in these areas. Bosses are highly reminiscent of early 90’s NES bosses. These characters evoke memories of boss encounters in games like Vice: Project Doom, and Shatterhand. They’re grand, over the top, and can only be defeated once you memorize an intricate pattern of movement. Unless of course, you come into them with all three power ups. But even then taking down that last shred of damage will prove difficult. But the difficulty of the bosses, like the levels leaves you a sense of satisfaction when you finally beat them. Which is good. Because the only way you get to play all of the stages is if you choose higher difficulty levels. You can also play the first three levels in whichever order you choose. Visually, the game holds up very well all of these years later. Sprites, are crisp, very detailed. as are the tile sets. The game has a very nice use of parallax scrolling, and the animation is top notch. The GBA, and DS run the Game Pak briskly, with little to no slowdown, save for one or two boss fights where a lot is going on. But even those are brief moments, that don’t ruin the game play. The chip tunes, and sound effects are really cool, with melodies you may find yourself humming a few hours after you put the game down. Some may be turned off by the high difficulty, but overall this is a highly recommended title assuming you can still find a copy. The game came out at the tail end of the Game Boy Advance’s lifespan. Like most games released at the end of a platform’s run, there weren’t a lot of copies made. At least not in comparison to the print runs of most games. 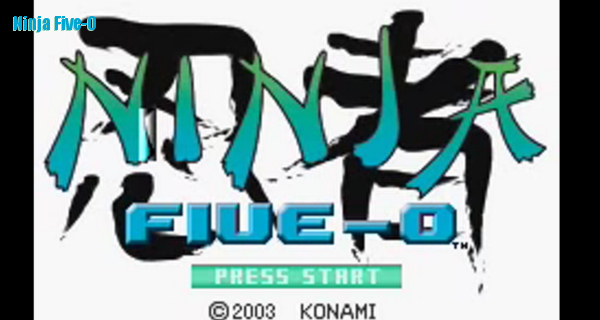 As such Ninja Five-O is pretty rare now, and is also pretty expensive. A loose copy goes for as much as a new release on a modern console, where complete or unopened copies fetch far more. That said, if you can afford a copy, or find a really good deal at a yard sale, pick this one up. It’s fun, challenging, and it’s one of the best Game Paks ever put out on the Game Boy Advance.